So you’ve heard there’s money in real estate. You’ve even told yourself to invest…someday. You’re waiting for the right time; waiting to have more money, or just waiting for the perfect opportunity to come along. The only problem is, waiting is the opposite of action. Investors take action. So should you. #1. You’re ready to call your own shots. Working a weekly nine to five job may pay the bills, but you don’t want to spend the rest of your life working for someone else’s dream. You’re ready to take charge and chart your own course. You want the freedom and flexibility to go on vacation, work from home or finally start your own business. Investing in real estate can produce the serious cash flow you need to make this a reality. #2. You dream of financial freedom. The average American household carries $137,000 in debt. While most people may dream of a debt free life and a rich retirement, the truth is most will never get there. Don’t be one of them. If you’re dreaming of building a nest egg or living debt-free, then real estate investing can help you prepare your finances today for a better tomorrow. #3. You want your money to make money. You’ve worked hard for your money and now it’s time for your money to work for you. Savings accounts can take years to accrue enough interest to make a profit. Other investment options come with high risk rarely worth the reward. With a buy low/sell high easy to navigate market, real estate can provide better returns with lower risk than stock market investing, making Real Estate Investments the perfect investment vehicle. Invest in something affordable first. Don’t dive into a large rental property that throws you in over your head as a landlord to multiple tenants. When in doubt, always choose what you can afford today, not borrow for tomorrow. Never underestimate the superior benefits that come from land investing. A long-term, tangible asset, land doesn’t wear out or depreciate and is an inexpensive, hands-off investment. Our Investor Packs are perfect to get you started. The stock market is the rock star of the investing world. Exciting, alluring, and extremely unpredictable. Real estate is a stable record player. Unlike stocks, land isn’t going anywhere. It won’t disappear overnight or depreciate in value based on the worth of a company. Land appreciates in value each year because we aren’t making any more of it. For the most stable asset, choose an urban or growing area in higher demand or a property with a variety of potential uses. Use positive cash flow to invest in bigger and better properties. Whether you invest in a small rental property or vacant land with a wealth of potential, you won’t get rich overnight. The secret to investing success is to use your positive cash flow to make larger investments. As a real estate investor, you should aim for a constant growth pattern. Good thing vacant land requires very little start-up capital and provides a variety of ways to produce positive cash flow. 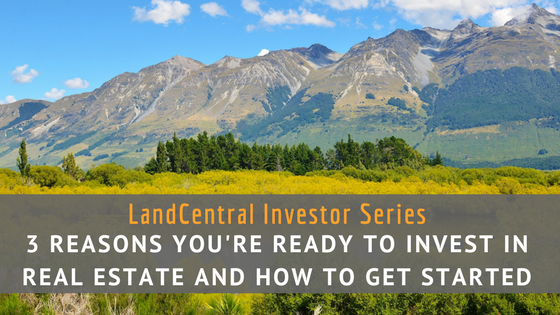 Learn the Top 6 Ways to Make Money on Your Land Investment. Your Financial Freedom is Calling. Invest Now!